There have been a lot of brown bears heading west past the cabin and we have been suspecting that the pink salmon are coming into the mouth of the Kambalnoe river on the coast. There has been some rain and wind for the past few days but this morning was clear and calm, so not having flown for a while I wanted to check if our prediction was true. The air was like crystal and very smooth, which is a treat in this country. 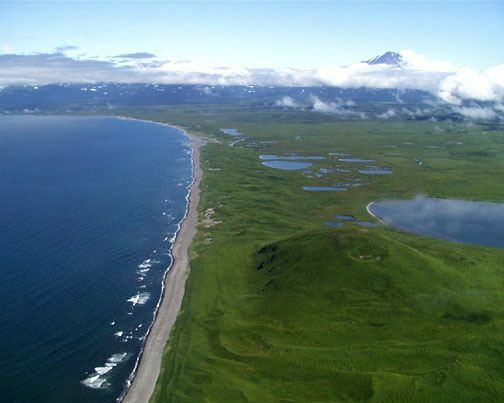 Its about 10 miles to the shore of the sea of Okhotsk, the first half has low bush but then it opens up into prairie-like tundra with tall grass covered sand dunes next to the sea. Its incredible to see bears in this open country and today there were many as the first mile of river was stiff with pinks. It makes me realize what it must have been like on the western plains of north America two hundred years ago, when the grizzly was still allowed to inhabit that area. It also is obvious why they were so vulnerable. They can be seen for miles and have few places to hide, so if there are grizzlies in the open country there is no one hunting them. Today I saw 80 bears on the flight there and back. 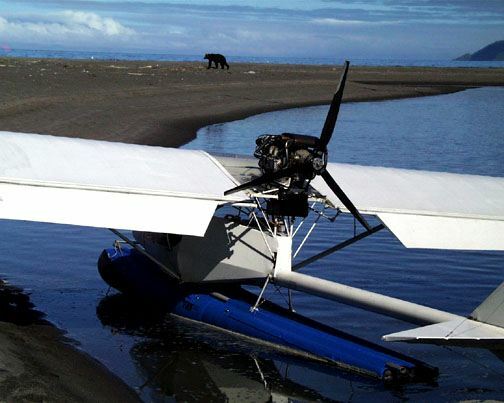 I landed where the river cuts through the sand dunes and taxied out to the beach. 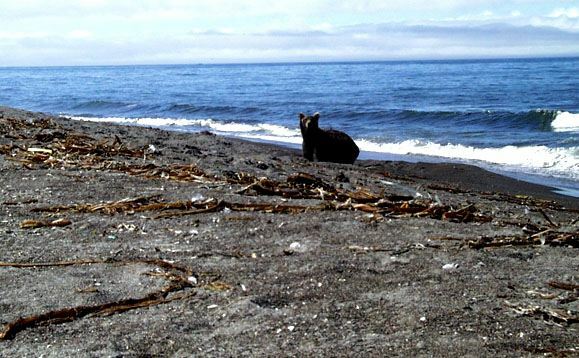 There were three bears wandering along the breakers, looking disinterested in all the salmon that were being left flopping on the sand when they miss the mouth of the creek (the river is rather small). There is only so much one can eat. One bear was digging something where the waves were rolling up the sand and when I later looked at the place I found that hundreds of small fish must have been buried in the sand during a big storm. He seemed to prefer them to the fresh salmon. The pink salmon will now work their way up river through our lake where our cubs will enjoy catching them in the small creek north of the cabin. The sockeye that came into the lake a few weeks ago are now spawning and will start dying soon so with the pine nuts and berries coming on they will soon have more than they know what to do with and should no problem putting on enough fat to hibernate through the winter.